USFWS (U.S. Fish and Wildlife Service) has repeatedly covertly promoted the killing of cats by allowing its employees to demonise free-roaming and feral cats in sponsored conferences and recently in writing to policymakers in Escambia County, Florida. 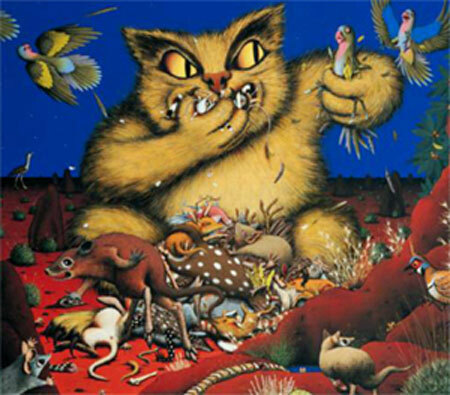 The image below is from a USFWS presentation showing the cat’s voracious appetite for killing wildlife. The letter to Escambia County, Florida stated that the agency strongly opposed freeroaming, domestic or feral cats and TNR programs. Apparently, the letter threatened possible legal action against the the county if they did not eliminate free ranging feral cats. That’s pretty plain talking to me although I have not seen the letter but the source of the information is highly reliable namely, Best Friends Animal Society; my thanks to them for this information. The USFWS have no declared policy on feral cats but they appear to be covertly or by implication supporting their employees who in effect promote the killing of feral cats as a way of dealing with them. The U.S. Fish and Wildlife Service also do something which I find unforgivable which is to base their hidden agenda on what is well-known to be highly inaccurate statistics about the predation of wildlife by feral and stray cats. The statistics are highly inflated and they are extrapolated from studies concerning certain areas and small populations of cats. In essence the statistics that are banded around and used by government agencies such as the U.S. Fish and Wildlife Service, are guesstimates is but perhaps I’m being too generous, they are actually guesses and often they are biased guesses because the scientists involved are sometimes themselves allegedly anti-cat. The declared goal of USFWS is to conserve US wildlife but do their actions support this? My gut feeling is that the USFWS struggles to balance the competing objectives of protecting wildlife while allowing economic growth and supporting business. Furthermore, I have a feeling that the USFWS tend to favour business over wildlife and by business I also include sport hunting and trapping for the fur-rate. I have no firm evidence to support this but it is based upon my reading what is going on. The stories that I read about the cat and wildlife, indicate that wildlife takes priority over the wild domestic cat i.e. a feral cat. Sometimes plain corruption is alleged at the USFWS. Think about it: the endless possibilities for lobbying pressure and bribery from big business on employees of the USFWS because wildlife gets in the way of commercial development. Feral cats are part of the ecosystem. They are wildlife. At least deal with them humanely and sensibly because out-and-out slaughter does not work. It is blind thinking born out of a dislike for the feral cat supported by inaccurate data on feral and stray cat predation peddled by biased scientists. Sharpen up and shape up, please, USFWS. It is time to show some integrity and loyalty to your declared mission. This entry was posted in Cat News and tagged cat predation, conservation, feral cat, human to cat relationship, stray cat, U.S. Fish and Wildlife Service by Michael Broad. Bookmark the permalink. In spite of all the opposition, especially from USFWS, Escambia County Florida Commissioners passed a TNR Ordinance to protect community cats on 9/11/14. I support a colony of seven feral cats (on my own one half acre of real estate in eastern Bradenton) that probably DO kill some wildlife (i.e. squirrels, blue jays, maybe baby opossums but also rats, voles/moles/cockroaches and other vermin (definitely NOT raccoons, coyotes or foxes). This is the world that is. While arrogant humans afford themselves the power to decide which species will live or die (indigenous or allegedly invasive (which IMHO parallels deciding which races/religions/sexual orientations are worth saving or eliminating). If there is no need for them to think up anything less provocative and more humane then please explain to me how that is differentiated from the cat behavior that the USFWS is advocating we eliminate? Arrogant humans afford themselves the power to decide which species will live or die; indigenous or “invasive”. This thinking, IMHO, mirrors public opinion on which races/religions/sexual orientations are worthy of saving or damning to elimination). Thanks for sharing. Good for you in supporting a colony of feral cats. They have equal value to any other animal as far as I am concerned. Such a beauty as well as the ones below. I agree. It’s just realistic and nature for cats to prey on other wildlife. No human has been assigned to decide who lives and who dies. The USFWS, basically, intimidated Escabian Couty, Florida into postponing their potential TNR program when they had no authority to do that. They have no policy regarding ferals but were able to “BOO” an entire county into inaction. In essence the USFWS, a branch of the federal government, broke the law by deceit and intimidation. The USFWS seem to be a little bit of a law unto themselves. Some government agencies can become rogue. They have no authority to make law and, that they disguised themselve as lawmakers, is criminal. Thanks Rick. I’ll check that out. How in the h-ll are they reaching population levels when they are neutered? I just did a post on this letter. I think the letter is very extreme and surprising. Is this the federal government’s position on feral cats? USFWS is a small branch of the Federal Government, just like the Postal Service is. They have no power to enact law. What they spew is not law, but their own policy. They have done no less than “booed” Escabian County. They need to be called on it. Will you send me a copy of the letter? I have a Congressman wanting additional information. Thanks. Hi Helana, If you click on the link below you’ll go to a copy of the letter where you can download it using the control which you’ll on the page. “Cat as the animal devil on Earth ” ? Horrible propaganda. I am afraid for some people especially people in authority the stray cat is still a “devil” a throwback almost to the time of witchcraft.